tell me if that worked. I have never transferred ownership of a Dropbox link, but was sure it would work. different event for her, and it was an "Album". Easy to see. without having them log in to Dropbox. in the order of how you could see them when a shared link is sent. because there are 180 photos, well, you can see where that would lead. All I can think of is to see what order (if any) Dropbox put the photos into when it re-ordered them. Is there any rhyme or reason to it? If so you might get a clue as to how DP wants them numbered and then you can renumber them yourself and start over. Otherwise I don't know. I've never had problem, I create a folder and send link. But if it's shared it probably looks like it's coming from me. You could try Proofcast.com. Not free. Skip - a guy here at work had the same issue. I can add them one by one, and keep them in the order I want, but it will take forever. Someone else suggested Google Photos. The simplest and easiest way, zip all the photos up, drop them onto dropbox and once uploaded the client unzips and all the images will be 'in order'. But, I honestly don't know why you are having trouble to begin with, I drop hundreds of images over the year straight into dropbox, not via a browser, I have DropBox on my Task Bar, and merely double click it to open an Explorer Window, navigate to the shared folder I want, then drop all the images at once in there and they always come in correct order. C/ drive/Users/'your user name'/DropBox, right click on it and select 'Send to...../choose Desktop Shortcut and you will have a permanent DB shortcut, but I have mine set to the Task Bar (bottom right of your screen) and it's in the 'Hidden Icons' part. 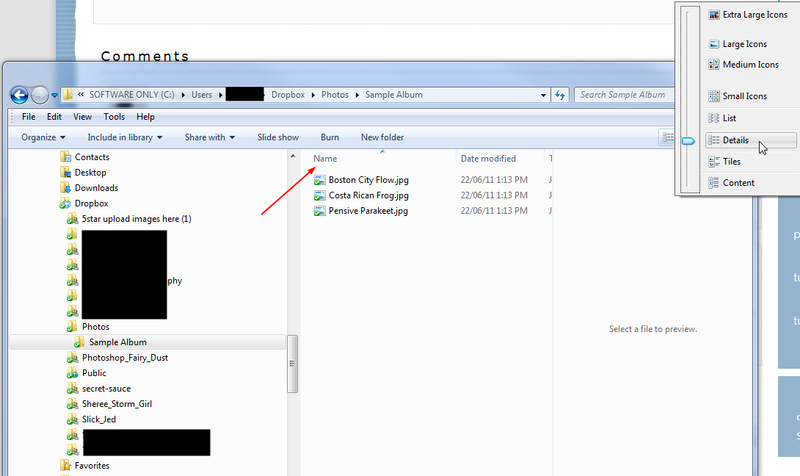 See images, one with DropBox, oh, also note the red arrow I have to make sure the 'names' are in correct order, tell clients that also, that is probably why they appear to be in random order, or, the 'Date Modified Tab' has been changed. There should absolutely no reason things are not in an order of your choosing at all. Also image attached showing my DropBox where it lives. Trev - try creating an album, and see what you get. When I upload to a folder, everything is in order. When I create an album from that folder, things are random order in the album. Do you have Lightroom, if so, create a slideshow in there of the images, then it becomes a single file, PDF or Video, and obviously will be in order. I do not create albums from Dropbox itself, but I believe you when you say it seems to screw up the order list, so give LR a go. Thanks, Trev. As I wrote, another person at work had the same issue with Dropbox. Photos that are contained in a folder in order somehow get out of order when you create an album. I have emailed Dropbox support, but we'll see how good the response is. Much of this had to do with the privacy issue, and the woman wanted a link to the photos that only she and the people at the event could have access to. I'll give LR a try and see what happens. Thanks! Just use Zenfolio. You can make a private album that only those with the link can see. Is there a cost to Zenfolio? I'm sure it is, but the requirement was for ability to view photos at no charge. I don't think there are any charges to clients; just you the photographer for having an account with Zenfolio. Oh, OK, I misunderstood. I did look at it a bit, and it looks like a website builder as well. I've got one with Wix. Zenfolio is built for photographers has all sorts of permissions you can set on galleries or individual files...view only, max file resolution, whether you want to allow downloading, etc. If you really want to make a business of this, you should take a serious look. As an aside, I use Zenfolio for print orders, but also as an additional online / off-site backup of all the JPGs for weddings and portraits and other shoots. I have searched a few forums, and found a lot of people have the same issue with the sequence being randomized when creating an album from a folder in Dropbox. No solution, other than adding them one by one to the album, but I haven't tried that. I have yet to investigate Google Photos, which someone at work suggested. FYI: I tried out Google Photos. Uploaded about 20 vacation photos. 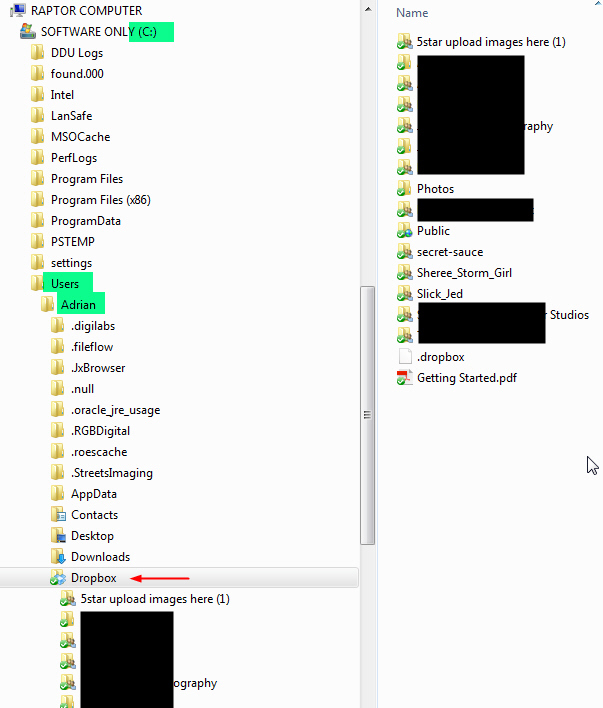 They went into the folder randomly (I didn't look to see why, but they did not load alphabetically). I created an album, and was able to move them around inside the album and order them the way I wanted. There is an option to get the link to the album. I emailed it to my 2nd email address, and it's just what I want. Next time I have a job and the customer wants an album link, I believe I will suggest this.